Disney Pixar’s animated film “Coco” is one of the few, if not the first, movies that aims to accurately represent the Latino culture. As a proud Latina, from the moment I heard about the making of “Coco”, I was both ecstatic and skeptical about the final result. Seeing as the movie seemed to specifically center on Dia de Los Muertos, I worried whether Coco was going to be just another movie that appropriates Latino Culture. So when the movie finally came out, I, along with my younger brother, headed straight to the theater with our fingers crossed hoping that my skepticism would be proven wrong. Now I am not saying that “Coco” was the absolute perfect portrayal of Latinos since it specifically centered on Mexican culture, but as a Latina who is Mexican, I was filled with laughter and tears because there was finally a movie that paid homage to my people. Throughout the remainder of that week, I tried understanding what it was exactly about “Coco” that made my younger brother and I leave the theater feeling completely proud of being Mexican. I held onto that feeling and encouraged all my family and friends to watch it. I wanted to know their input and whether they resonated with “Coco” the way I did. I also took my grandmother to watch one of the showings in Spanish, which made connecting with the film even more amazing. She, along with the rest of my family, absolutely loved it. We laughed, cried, and whispered throughout the movie about how certain characters reminded us of certain family members. From my seventeen-year-old brother to my seventy-eight-year-old grandmother, we were each able to identify with the characters on screen because “Coco” accurately and positively highlighted our culture. This is incredibly rare in the entertainment industry. Accurate portrayals of Latinos’ realities are never shown and so to finally have a movie that focuses on just how beautiful our culture is left me, along with the rest of my family, overjoyed. We are sadly accustomed to the negative portrayals of Latinos in mainstream television and film. 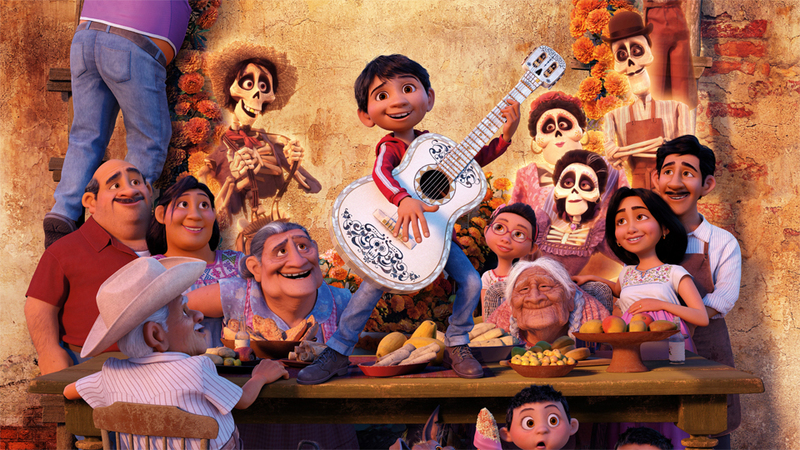 In “Coco,” there are no negative portrayals. The characters are simply portrayed as everyday people who are for once not being judged by their ethnicity. Personally, I view “Coco” as being revolutionary in that it helps pave the way for Latinos to start demanding proper representation. There is a place for Latinos within media and “Coco” proves just how important accurate representation is. My brother laughed and got teary-eyed because for once he was able to see himself and his family through the characters within the movie. My grandmother cried at the fact that she had never seen a movie, specifically an animation, that centered around our culture. I, a twenty-two-year-old, cried at the fact that I finally got to see people just like me, regardless of animation, on the big screen being portrayed as we actually are. We are family-oriented, loving and strong. So to the non-Latino couple who sat next to my brother and me during the movie and gave us odd looks while we laughed and cried, you have to acknowledge that this movie spoke to us in ways that you do not understand because it has been long overdue. “Coco” focuses on accurately representing Latinos, which is why it is a treasure and I encourage everyone to go watch it.